Meet Jonathan, an out of this world little boy for a Mom that describes her son as simply, "her world!" 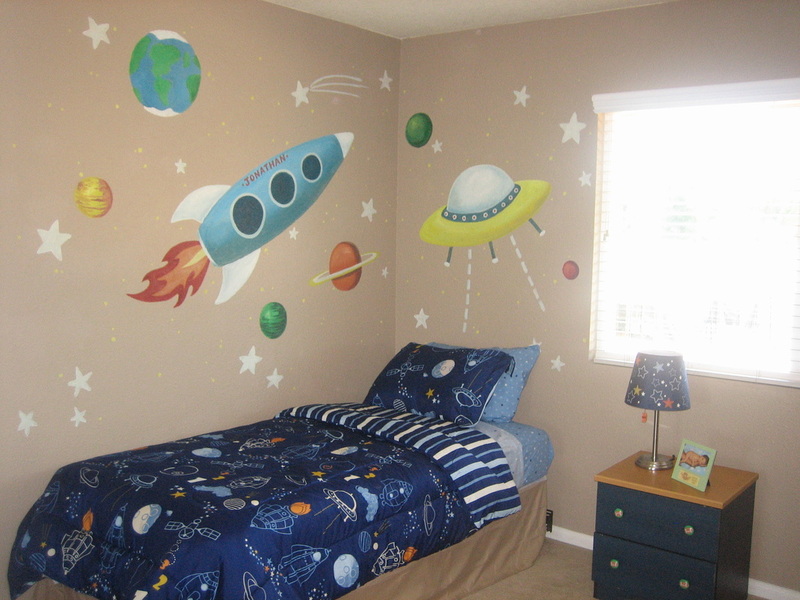 Jonathan was nominated for a Sweet Dream Room Makeover by his therapist at Sunny Days. Jonathon's therapist described him as an incredible and brilliant little boy that is trapped in a body that just doesn't move the way he wants it to. His therapist shared that his Mom faithfully takes him to physical, occupational and speech therapy appointments and is always very active and involved with his care and treatment. The family is dedicated, passionate and very supportive of their son to ensure he gets everything he needs to live a full and happy life. Our volunteers immediately fell in love this Mom due to her sweet nature and appreciative spirit, as well as the way she spoke about her son. Within minutes of our team leaving her house we received a wonderful call from Mom to thank Cecily's Closet for this gift. We love to hear from happy families and we are delighted that Mom and Jonathan are enjoying his new special space. Jonathan has not had an easy road but he and his family are not complainers! They are grateful for their precious son and the many gifts he has brought to their life. When Mom was five months pregnant with Jonathan the Doctors discovered that he had gastroschisis a birth defect that prevents the baby's belly from closing completely during development, exposing the intestine. A preemie baby, he was born at 34 weeks via C-section because his little heart was undergoing stress. After more than 45 days in the hospital he was able to go home with his loving parents. Complications with feeding later revealed he was aspirating most of his food to his lungs so he had a G-tube placed to ensure he received the proper nutrition to grow and thrive. He was ultimately diagnosed with Cerebral Palsy. His Mom describes Jonathan as "her world"! She says despite everything he has faced he is a very happy, social, loving and smart little boy. He now has a fun place to play and sleep and dream of travels to outer space! Cecily's Closet continues to receive more requests for Sweet Dream room makeovers than we could ever hope to fund. Thanks to recent grants from UPS, and donations from corporations like Websense and Emerson, Cecily's Closet is committed to doing more Art Makes a Difference Rooms. These rooms put the focus on the murals/art and enable us to utilize the time and talents of artists in our community so we may process more room makeover requests. 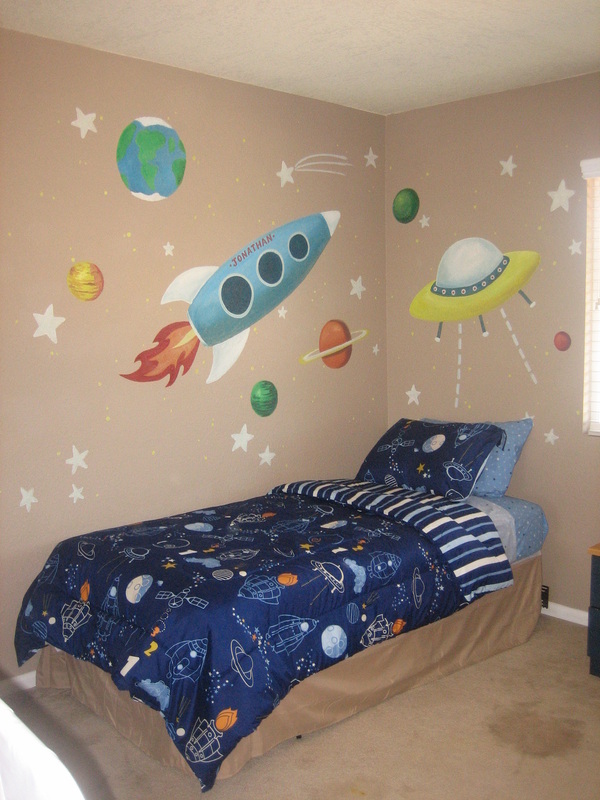 Thank you to a returning artist, Hanna, of Hanna's Murals, for helping us make Jonathan's room an out of this world place for him to grow and thrive. Hanna is an amazing artist and we are so grateful for her continuing support of our little organization. She is a dream to work with and her work speaks for itself! Hanna has painted hundreds of murals all over California. She started painting small residential murals, mostly nurseries and playrooms, and over the years has progressed into large-scale exterior murals. She does a lot of philanthropic work in our community and we are lucky to have her on our team! And a special thank you to my chief advisor, friend and volunteer, Gina, for leading this effort. Gina worked with the family, did all the shopping and managed the entire project so we can take a little break to care for our new baby, Cason. Thank you to our donors, family and friends for making this "Art Makes a Difference" room possible!